A plain white T-shirt, striped pants from the Thrift store and a borrowed pair of black coat tails. We purchased a $1 pair of skeleton gloves, a $1 Christmas hat and a $1 pumpkin. His tie was handmade out of black craft foam and white fabric paint. Black and white face paint finished the job nicely. 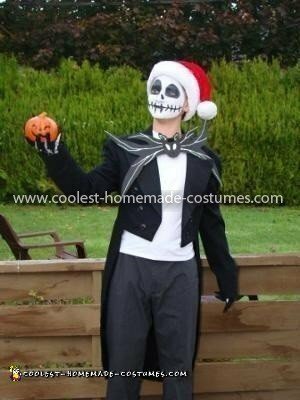 This Homemade Jack The Pumpkin King Costume was made for under $15.